4 External power supply 12-20V, screw terminal. Use 1 or 4, but not both! 3 48/96/192kHz jumper. By default the internal sample rate of the DSP is 48kHz. This allows the maximum computing power. If you want to design your own DSP program that runs at higher sample rates, this jumper has to be set. This is only for very advanced users. Changing the sample rate of the DSP will require a lot of changes in the provides sample project! 4 MUTE – mutes the amplifier output. We recommend to remove this. You can also control the MUTE function from the Raspberry Pi or from a DSP program. If you’re using our DSP programs, remove this jumper. 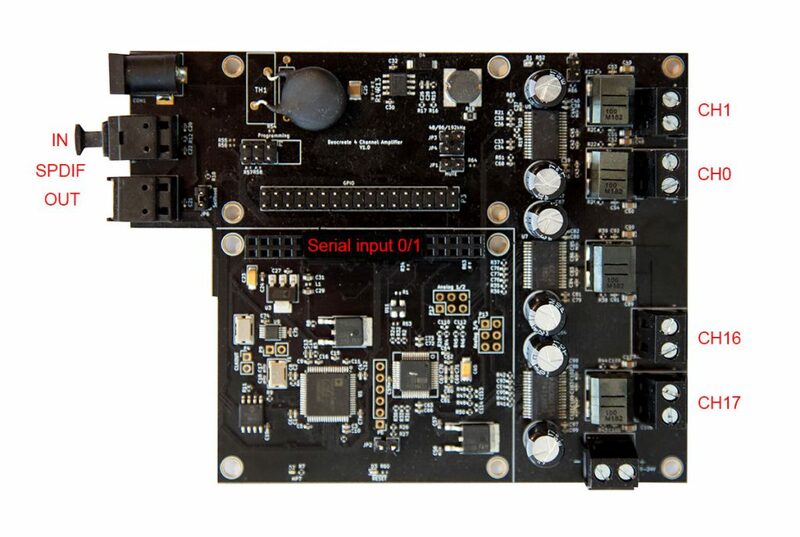 The DSP used on the Beocreate 4 channel amplifier can handle up to 48 input and output channels. If you design your own DSP programs, it is important to know which channels are used on our board. The following picture shows you the mapping. Note that both the Raspberry Pi input and the SPDIF input can’t be connected directly to the DSP core, but via one of the asynchrounously sample rate converters (ASRC) that are integrated. The reason for this is the following: The DSP core always runs at a fixed sample rate (our profiles use 48kHz, but you can also use sample rates up to 192kHz), while both the SPDIF input and the Raspberry Pi audio input can run at different sample rates. Therefore, there need to be converted to the sample rate of the DSP core. Well, doesn’t have this a negative impact on the sound quality? While simple sample rate conversions can have a negative impact on sound quality, the ASRC on the DSP performs very well. It provides a signal-to-noise ratio of 120dB. Therefore there is no audible impact on the sound quality.